The Berkshire is Lopi’s medium sized gas stove. With a 31,000 BTU input and heating capabilities up to 1,500 square feet, this stove is ideal for zonal heating in large areas of your home. The Berkshire features the award winning Ember-Fyre™ burner with the realistic, highly detailed log set and embers. A beautiful open fire view showcases the fire and includes high quality, high clarity tempered glass that comes standard with the 2015 ANSI-compliant invisible safety screen for added safety from accidental contact with hot glass surfaces. Standard interior accent lighting and Comfort Control allow you to enjoy the ambiance of this stove all year-round by being able to highlight the fire display and control the heat to a comfortable setting for any occasion. 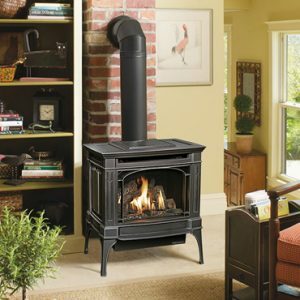 The Berkshire features the optional GreenSmart™ 2 Wall Mounted Remote that allows you to control every function of this stove from the comfort of your favorite chair.